SMYRNA, Ga. - Nov. 10, 2014 - PRLog -- Dr. Michael Craig (62) retired as a chiropractor in the early 1990s because he was burned out and needed to rest. Now he plans to ride a unicycle 200 miles on the Silver Comet and Chief Ladiga Trails, through Georgia and Alabama, on November 13-17, 2014 as part of a special event to raise money for his favorite orphan charity. Those interested in following Michael's ride and hearng more about his story can check out his daily video blogs duirng the ride, and donate to the charity at http://1000mileproject.org. Dr. Craig credits his recovery to paying more attention to his diet and hormone levels . . . and also to getting more exercise. "Since I hate going to the gym," he explained, "I tried to come up with a way to get exercise that I would enjoy." 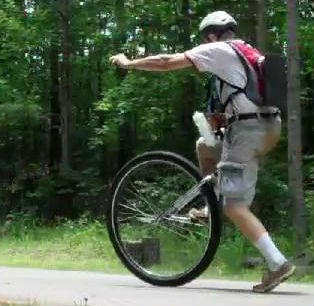 That's when he came up with the idea in 2009 to start riding a unicycle - again - after 40 years. In 2010, Michael set a goal to ride a thousand miles in a year for the Himalayan Children's Charities (HCC), a non-profit foundation set up by friends Bruce and Susan Keenan. Since then he has completed three 1000-mile years, and is about to wrap up his fourth during the long ride. "Doing it for those orphans makes it easy to get out every day and ride," says Dr. Craig. "HCC is doing their part - they provide food, clothing, shelter and education for dozens of orphans in Nepal . . . and 100% of the domations goes to the kids. I really like that!" He regularly posts updates to both the orphan charity and his unicycle rides at http://1000mileproject.org, and also features a direct PayPal link to HCC for donations of any size. Michael and his riding companion, Merritt Shealy, plan to start their ride at the beginning of the Silver Comet Trail in Smyna, Georgia, on November the 13th, travel to Anniston, Alabama, 100 miles away. They will then return to Smyrna, all the while averaging about 9-10 miles per hour, including frequent stops. As a consession to comfort, Michael and Merritt plan to break up the long ride with stays at hotels along the way, and to grab meals wherever they can. "I want to ride hard during the day . . . but sleep well at night," adds Michael. "No need to suffer, right?"